Above: The Charlotte Tilbury Filmstar Bronze + Glow comes in a stunning rose gold compact, reminiscent of more glamorous days of the past. A few weeks back, I mentioned ordering the Charlotte Tilbury Filmstar Bronze + Glow compact from the Nordstrom Anniversary Sale (running now through August 4th). An update a week later briefly showcased it's beauty and utility. Now, after nearly two weeks of daily use, I am ready to extend my comprehensive review of this magnificent procurement. Above: The Bronze + Glow kit from Nordstrom also comes with a luxurious brush for ease of application. Above: I was duly impressed by the intricacies of the packaging. Above: Layer by layer, every part of the box housing the compact is representative of great thought and care. Above: The full ingredients list...delightfully short in my opinion! Above: The rose-gold compact is captivating and the quality metal has not scratched yet, even when tossed into my purse. Currently available at both Nordstrom and Selfridges, this compact is not only endlessly beautiful; it also delivers gorgeous results. Over my two weeks of testing, I have allowed this single product to replace my regular contour, bronzer and highlighter needs and find that just a little bit is necessary to create a warm, sculpted, glowy look. Following foundation, I like to apply the "Sculpt" shade to the hollows of my cheek bones, down the sides of my nose, along my jawline and the outer edges of my forehead for a defined, cohesive look. Then, I use a smaller brush to apply the "Highlight" shade along my upper cheek bones (a little goes a long way! ), on my upper brown bones and down the center of my nose for an illuminated effect. The entire process takes me a less than 60 seconds and the results, I daresay, are flattering. Above: Since the product is so pigmented, only a bit is need to achieve results on my light-medium skin. This image depicts the nominal amount of wear on the pans after two weeks of daily use...still looks like new! This is a secret that silver screen sirens have kept to themselves for years – and once I share it with you – so will you! With FILMSTAR BRONZE & GLOW you can slim, sculpt, shorten, trim and highlight your features. It’s amazing what clever shading and highlighting tricks can do to your facial framework - it’s an illusion that I use all the time, particularly for red carpet scrutiny, and my clients can’t get enough of it. Take what you were born with and maximise your assets with FILMSTAR BRONZE & GLOW! • The bronzer is the perfect universal blend of pearl and pigment to contour features and mimic a sun-kissed complexion. • The highlighter is built up from a golden base that flatters any skin tone, and uses Light Flex Technology to capture light and radiate it out for a luminous complexion. • Colour-rich pigments are rolled into elastomer pearls that smooth & buff the skin for excellent blendability & perfect colour uniformity. Above: A closeup of the Sculpt shade. Above: A closeup of the Highlight shade. Above: Swatches of Sculpt + Highlight in direct sunlight. Above (clockwise from top L-R): Charlotte Tilbury Bronze + Glow, Napoleon Perdis Matte Bronze, Daniel Sandler Sculpt and Slim, Chanel Cream Blush in Cheeky, NARS Matte Multiple in Altai (the packaging has not held up well in my makeup bag!) and Tom Ford Shade and Illuminate Intensity 01. In light of the plethora of bronzing and contouring products on the market and in my collection (! ), I decided to engage in some comparison swatching...I hope the following images and shade/texture descriptions help you to better envision the beauty that is the Charlotte Tilbury Bronze and Glow. 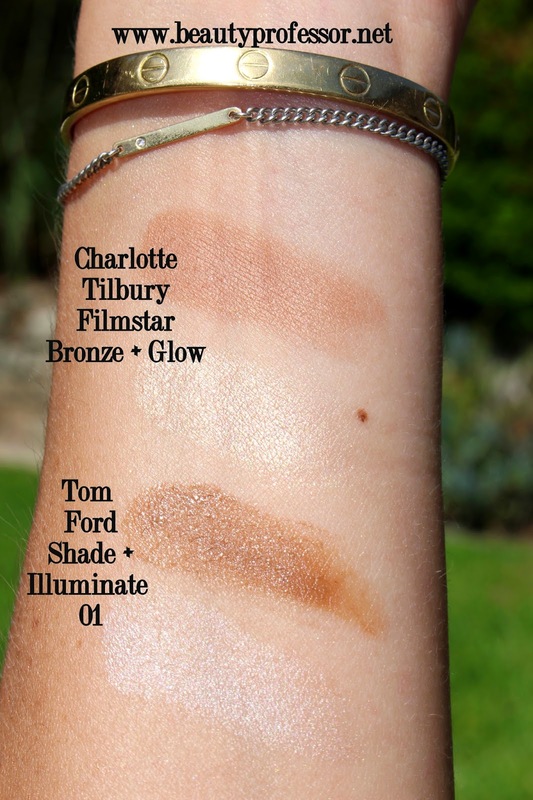 Above: Swatches of CT Bronze + Glow and TF Shade + Illuminate Intensity 01 in direct sunlight (with a flash). The first juxtaposition involves two products many of my readers and subscribers have asked me to address: the CT Bronze + Glow vs. the ever-lauded Tom Ford Shade and Illuminate (already reviewed HERE). Both have similar luxury reputations, high-end price points and flattering results, however, their chief differences reside in the areas of texture and undertone. Whereas the Sculpt portion of the Charlotte Tilbury is obviously a powder product (albeit, finely-milled and extra smooth) with a luminous satin finish, the legendary Tom Ford "Shade" section is cream-based and shimmer free. Additionally, the Bronze + Glow leans more neutral and "true tan" while the Shade + Illuminate is a warm brown that could initially look daunting in the pan. Overall, both shades are perfectly suited to improving one's canvas and I would deem the TF version more of a classic contour (especially because of its traditional "brown" base) while the CT incarnation is perfect for everyday use due to its "bronzer vibe" and extreme ease of application. Above: Closeup swatches of TF Shade + Illuminate Intensity 01 and CT Bronze and Glow in direct sunlight. Finally, the highlighter portions have markedly different undertones as well; the CT "Highlight" has a subtle champagne gold pearl effect that is highly pigmented for such a fair shade...a little truly goes a long way. With regards to the TF "Illuminate," this transparent cream offers luminescence without pulling gold or silver in sheen...it looks more like naturally radiant skin rather than a "shimmer." That being said, I prefer the ease of application and lasting power of the CT "Highlight," as I feel the TF "Illuminate" is so subtle that I have to use quite a bit more, and then, due to its emollient texture, run the risk of it migrating on the face. Above: Swatches of Daniel Sandler Sculpt + Slim, Tom Ford Shade + Illuminate Intensity 01 and Charlotte Tilbury Bronze + Glow in direct sunlight. The next close-up comparison is between the CT, TF and another power-based formula, the Daniel Sandler Sculpt and Slim (reviewed HERE). I delineate a strong similarity between the CT and Daniel Sandler versions, from texture to satin finish, both of these compacts achieve a similar outcome. However, the CT is more finely milled and feels creamier to the touch...the bronze shade leans more neutral (closer to the true brown of the TF) in contrast to the Daniel Sandler, which translates as a more traditional medium bronze. The highlighters are also different; the CT has much more depth of sheen than the Daniel Sandler, which is a muted light champagne. 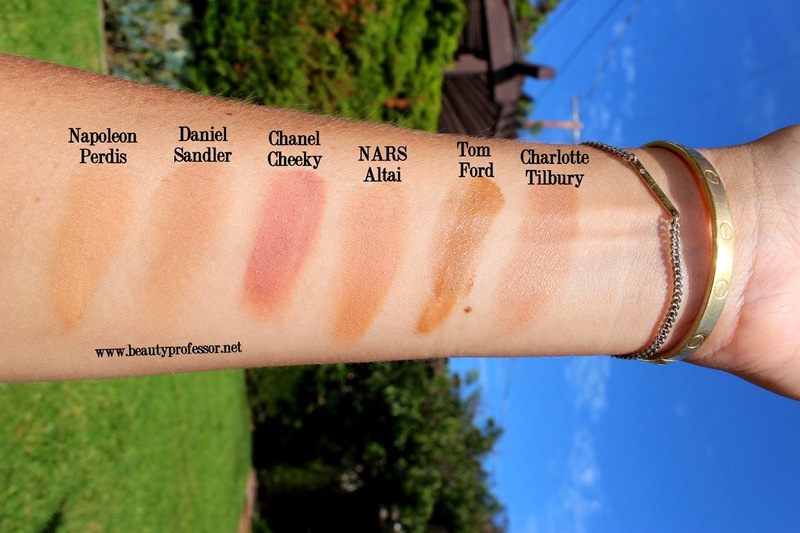 Overall, the Daniel Sandler might be a better option for someone with very fair skin or a heavy hand, while the Charlotte Tilbury will compliment most skin tones in the light-medium-medium/dark range and those looking for remarkable pigmentation in a single product. 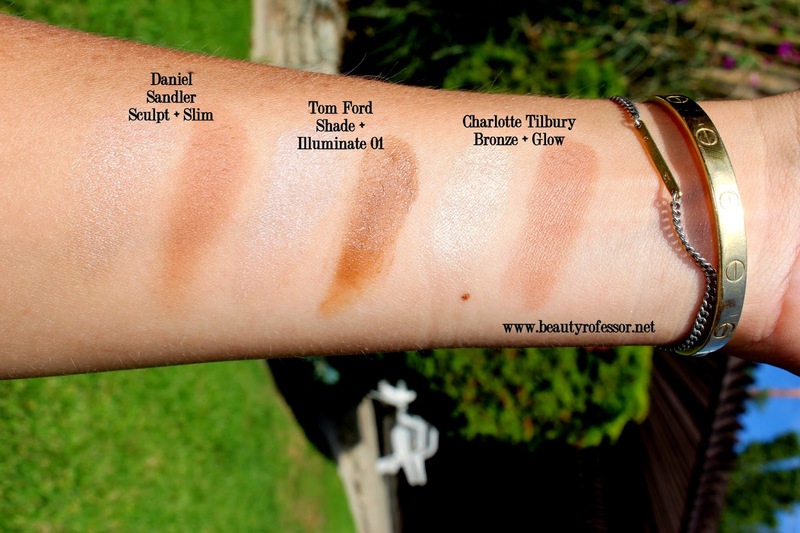 Above: Contour/bronzing options swatched in direct sunlight. Finally, I chose to compare the CT bronze portion with some other well-loved bronzing/contour products (in both cream and powder textures) from Chanel, NARS and Napoleon Perdis. Lighter and more neutral than Tom Ford Shade + Illuminate 01 (reviewed HERE); it also has a slight shimmery sheen, which the Tom Ford does not possess. Lighter and warmer than the Chanel Cheeky (reviewed HERE), which also doesn't have any shimmer. Darker and more neutral than the Napoleon Matte Bronze (reviewed HERE), which also has no shimmer whatsoever. Bottom Line: The Charlotte Tilbury Filmstar Cheekbones Bronze + Glow (available at Net-A-Porter, Nordstrom and Selfridges) is a must for contour enthusiasts seeking an easy way to enhance facial depth and add a natural, glowing warmth to the complexion. I am so pleased with this purchase and know that it likely commemorates the start of many more Charlotte Tilbury acquisitions. Her makeup is pure luxury and, like other lines created by uber-talented makeup artists (Troy Surratt + Surratt Beauty immediately come to mind), strikes an essential balance between dreamy, creative vision and utter wearability. Highly recommended! I hope your week is off to a wonderful start and welcome your questions and comments on this product...have you tried it yet? Thoughts? What are some of your favorite contour products? Well... Clearly this is something I "need". Great review and thanks for all the pictures of it in action! This duo is such a treat! If I get anything from her line it's gotta be a quad first! Fantastic, Sharlynn...keep me posted on what you pick out! Thank you so much...yes, having immediate access to the whole line will be marvelous (and dangerous!). It sounds like you have some fantastic bronzer and highlighter options in your arsenal and this would make a lovely addition. I, too, have a ton of options but am really glad I decided to splurge on this duo...it's now always in my purse! Such beautiful products from her line! Indeed, Shireen! I hope your week is going well! Did you use it as a blush? My Nars Matte Multiples have done that too! They need to work on that! Hello Gummy...good to hear from you! Truly, this compact is so worth it...I still use mine nearly every day! I do have that RBR shade and find that the CT sculpt shade is a touch more pigmented (and leans a bit more brown rather than the natural bronze of the RBR) and feels "softer" in the pan. I have run through many RBR At Goldcombe Bays and love it...the CT just feels like more of a true "contour."